We first wrote about Taco Nazo in 2009 when this site launched – and we have not had a chance to update the post since then. It is interesting to compare the 2009 listing with many listings we have created since then as our knowledge has grown and so has the sophistication of the taco trucks of Columbus. No Latino Mobile vendor epitomizes that more than Quicho from Taco Nazo…..I mean, Super Taco Nazo. Quicho took what he learned from years in the Taco Truck trade and incorporated that knowledge into the Super Taco Nazo Trailer. He has a better layout inside that has a lower serving window and less hassles than his original truck. He is working on the original Taco Nazo to make it a true mobile Taco Truck for corporate lunches and catering. A brief note about the food, it is among the best in the category of standard Taco Truck fare, easily in our top ten, probably in the top five of at least one of the Three Taco Trucks Amigos. Taco Nazo always wins in consistency. This is a frequent introductory trip for first time Taco Truck adventurers and especially those that are skeptical of mobile Mexican Cuisine. The large quesadilla has never let me down when hoping to have a gringo greenhorn try out a truck and want to come back for more. For the Taco Truck Columbus creators our relationship with Quicho and the truck goes long and deep. Although we have not updated the listing for Taco Nazo in years, this vendor has been the most frequent flyer for mentions on the website and in the community as well. Join me for a trip down memory lane. There are two counterintuitive and unwritten laws for Taco Trucks: 1) Most of the vendors are not mobile 2) Due to a combination of language barriers, cultural differences and etc., many taco truck owners are not the most, shall we say, consistently time conscious. Quicho from Taco Nazo has always been there when we needed him to help spread the word about these mobile kitchens. Quicho is no slouch when it comes to customer appreciation, every Thanksgiving, he hosts a Dia del Pavo (Turkey Day) with free tamales, atole and other goodies for old and new customers alike. When we needed a truck to be open at 5:30 am for an early morning television show – Quicho was there and ready to serve. It also connected us with new-found pal and now Foodcast comrade – Johnny DiLoretto. Anytime we needed a vendor for a bike and car Taco Truck tour event – Quicho was ready, willing and able to participate and add to the festivities often with some incredible cakes. The highlight of the early years was pairing Rick Bayless with Quicho for a special event. We are not sure which one was more thrilled with their meeting but we think it established some major street cred for Taco Trucks in our community. 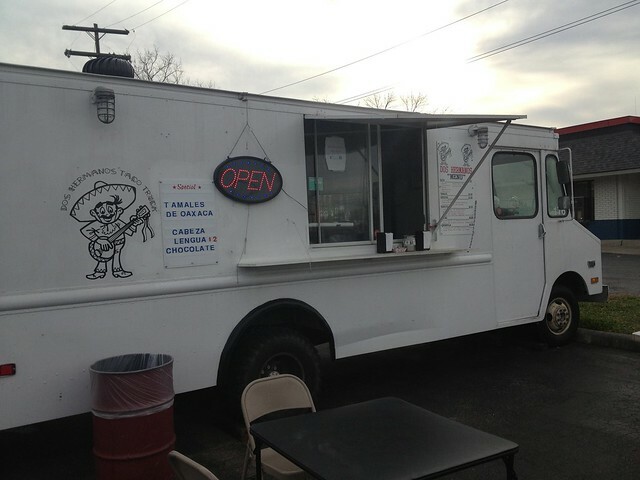 An article by Columbus Alive allowed us to do a tour of several Taco Trucks, including Taco Nazo and cemented a connection with G.A. Benton and photographer Jodi Miller. All work and no play makes the Taco Truck website a dull read, so when Taco Drew conjured up a David vs. Goliath Taco Truck vs. Taco Bell Challenge – Quicho was ready for the battle. We don’t have to tell you who won that one. We have observed, in many of our community connections that most successful businesses make a habit of giving back to the community they serve. Quicho continues to do so in his support of the Latino community as well as youth soccer leagues. Quicho is also one of the first go to with mainstream advertising for his business. On an end note (not final note, because Taco Nazo will continue to be on our blogs and in our tweets as the business keeps growing) it has been interesting to watch Quicho share his space and his wisdom with a new Indonesian mobile food vendor in the lot he has occupied since he started. Quicho has embraced the diversity of a new competitor as a collaborator and from the perspective of a peer and coach instead of with fear and distrust that he encountered when he started his kitchen on wheels years ago. Columbus Taco Trucks: You’ve come a long way Bambina! Taco Trucks crossed the decade mark in the Capital City last year. While still not quite mainstream, the acceptance of these kitchens on wheels has come a long way. While the non-taco truck mobile food scene has exploded since 2010, the number of taco trucks in Columbus has remained about the same, in the 35-40 range. However, the community has not stagnated. Taco Nazo, is now Super Taco Nazo as a trailer. The original Taco Nazo is being prepared to be a true mobile food vendor for roving lunches and catering around town starting in the spring. Juniors and El Mantinal Latino had added extra trucks for catering. The two spin-off brick and mortar restaurants from taco trucks (Super Torta and Los Gauchos) are still doing well. The Taco Truck has not been forgotten, not by any means. This year something happened under the radar that deserves mention. 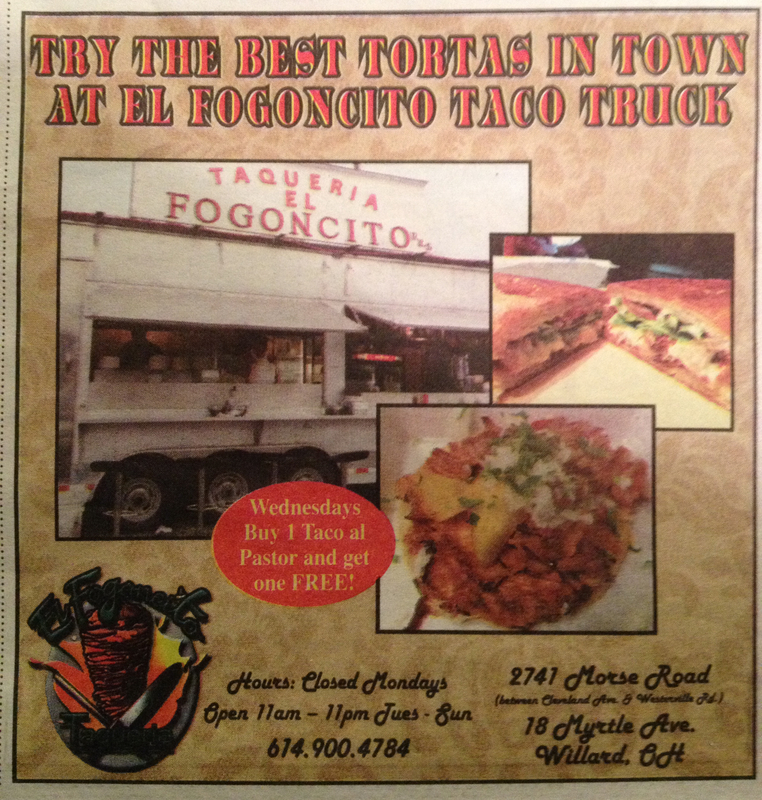 Again, while still not embraced by Joe Average in Columbus, Taco Trucks have gone mainstream in one area….advertising. See the examples below. a Valu-Pak coupon…one seen over several months in Clintonville. Taco Trucks are putting money into the local economy via mainstream advertising…that is assimilation as American as it gets. No you are not seeing double. There are two Tizoncitos. They are not connected. This one is blue. The other one is orange. This one is officially Taqueria El Tizoncito. The other one is El Tizoncito Taqueria. Tizon can mean: live coal, brand, burning wood, firebrand or a smoldering piece of wood. A bit of taco truck history, long ago, before taco trucks Columbus was a concept there were rumors of a Taco Truck on Olentangy River Road that had been there for years….this is not the truck – it closed long ago, but is good to see a Mobile Mexican eatery back in one of the first Taco Truck haunts in town. El Tizoncito has a standard taco truck fare with a couple of additions – mainly Tinga in multiple forms including quesadillas, Pambazos and Tostadas. The service is friendly, the older woman who works during the day loves to chat if you can speak some Spanish and she was very intrigued by the existence of the other Tizoncito. We may write more about this truck when (if) we do a post about Taco Trucks at 2020 Night Club. The first thing visitors need to know about El Tizoncito is that there are two Tizoncitos. This is the newest one and it is orange. As for the other (the original), we will write about it later – although it does hang out in this neck of the woods at the 2020 Night Club on the weekends. The second thing visitors may want to consider is don’t judge a book by its cover and don’t judge a taco truck by it’s exterior or lack of site ambiance. The fare here was much better than this veteran tasting team expected. The truck debuted in October (inspected and permitted by Columbus Public Health on 10/25/12). The menu features a lot of “plate dishes” or platos. We were a bit skeptical of “D” Joker: beef, mushrooms, and a lot cheese served with a salad of lettuce, cucumber, radishes and tomato. The Gobacha included al pastor pork, cheese and pineapple (pictured below). Both of these dishes would be well worth a return trip. We found the tacos a little bland but serviceable. We also noted, but were not able to try, the specials which included posole and Menudo. Although there is a lot of competition among taco trucks in this stretch of town, El Tizoncito (the other) is above average compared to many of its neighbors and features some platters at a good value. 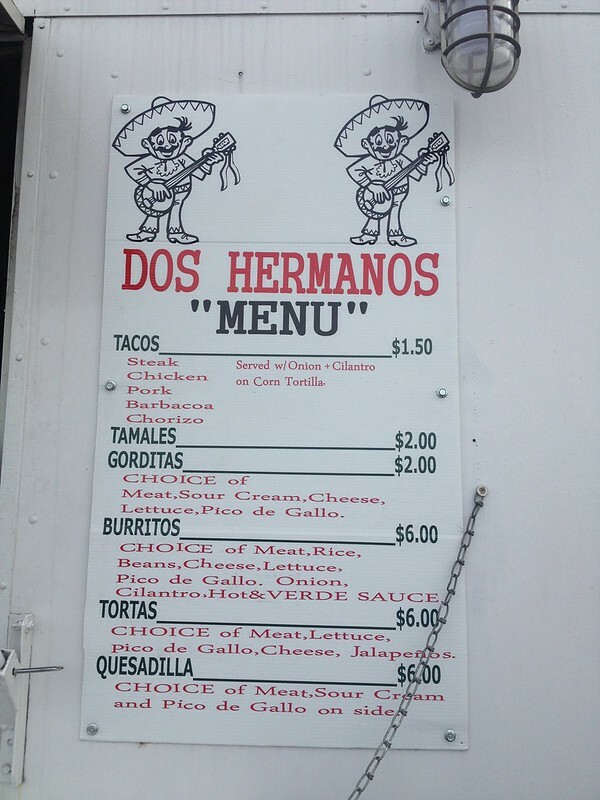 The first thing to know about Dos Hermanos is that there are no brothers involved, but the truck is a family affair. Lisa Gutierrez met her husband Vincente while they worked together at the Cheesecake Factory. Lisa came to Columbus from the east coast to open the Cheesecake Factory at Easton – she got more than she bargained for with her new city. She married and came to see our city as home. She minds the truck during the day and Vincente takes over in the evening. Dominga Medina helps them out as well with some of her Oaxacan specialties. Dos Hermanos does feature a few items that are less common in the world of Taco Trucks: mole sauce made from scratch by Dominga and hot chocolate. The menu features the standard taco truck fare of tacos, burritos and such. 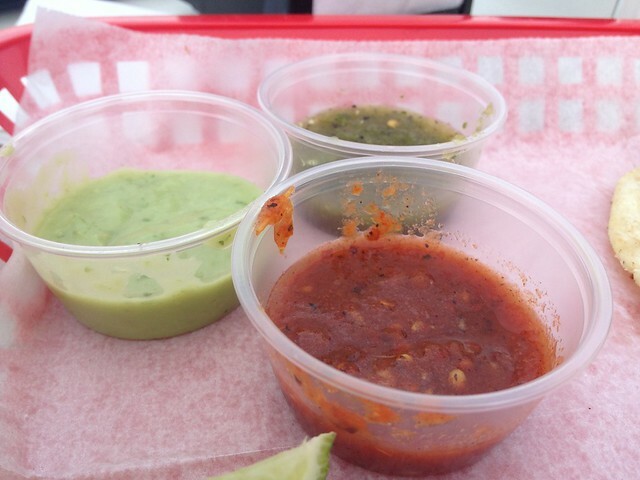 Our test run team found the salsas really stand out from the rest of the taco truck crowd. The three featured salsas are: Tomatillo and Jalapeno; Tomato and Jalapeno; and Avocado with Tomatillo and cilantro. The salsas are made fresh and taste that way. They are also made without oil which is less common in the taco truck trade. 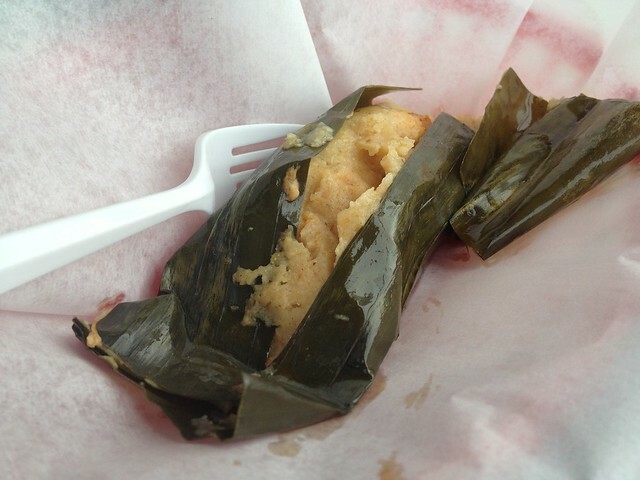 Dominga makes Oaxaca style Tamales as a special at Dos Hermanos, some specials change by the day and sometimes run out early. If have you have been hesitant to try a taco truck due to “dontspeakspanishphobia” have no fear here, Lisa is a native speaker of English and has over a decade of experience with the Midwestern dialect.